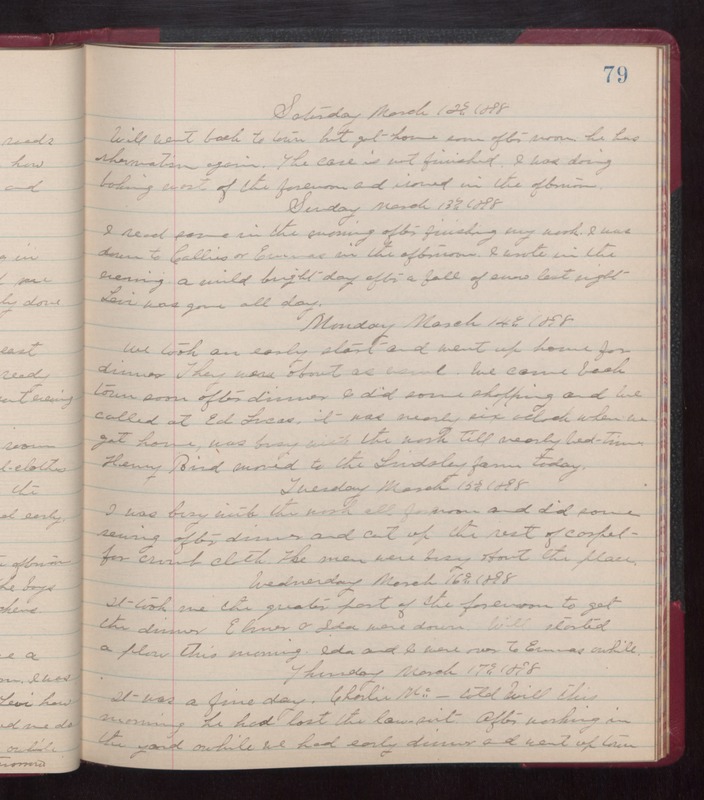 Saturday March 12th 1898 Will went back to town but got home soon after noon. he has rheumatism again. The came is not finished. I was doing baking most of the forenoon and ironed in the afternoon. Sunday March 13th 1898 I read some in the morning after finishing my work. I was down to Callies and Emmas in the afternoon. I wrote in the evening. A mild bright day after a fall of snow last night. Levi was gone all day. Monday March 14th 1898 We took an early start and went up home for dinner. They were about as usual. We came back town soon after dinner. I did some shopping and we called at Ed Lucas. It was nearly six oclock when we got home. was busy with the work till nearly bed-time. Henry Bird moved to the Lindsley farm today. Tuesday March 15th 1898 I was busy with the work all forenoon and did some sewing after dinner and cut up the rest of carpet for crumb cloth. The men were busy about the place. Wednesday March 16th 1898 It took me the quarter part of the forenoon to get the dinner. Elmer & Ida were down. Will started a plow this morning. Ida and I were over to Emmas awhile. Thursday March 17th 1898 It was a fine day. Charlie Mc-- told Will this morning he had last the lawsuit. After working in the yard awhile we had early dinner and went to town.